Fira de Barcelona, NRW meeting, old school mobile dudes and Mobile Sunday Networking. Today we arrived in Barcelona for the Mobile World Congress which will start tomorrow. But already tonight we had the first events. Firstly we went to the BBrB ba ba reeba for dinner with other co-exhibitors from Germany like Twistbox Games, VIVAI Software AG and itec systems AG. Our shared exhibition stand with companies from the German land North Rhine Westphalia war organisiert by Dr. Bettina Horster and David Fickeisen. Later on we went for the first Mobile Industry Event called ‚Mobile Sunday Barcelona‚ at the CLUB MIX. In fact it was the fourth annual Mobile Sunday which is an unofficial, informal and generally cool and funky gathering of all kind of people from the mobile industry. On the party I meet some dudes like Philippe Souidi (CScout Trendberatung GmbH), Sarik Weber (cellity) and Jörg Land (cellity) – and of course some regular guests like the Mobile Monday Germany guys Daniel, Harald and Mark. 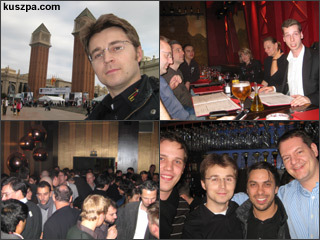 You can find more Events in Barcelona during the Mobile World Congress in the 2009 Mobile World Congress Party List. ← Zurück Vorheriger Beitrag: Whom should Mobile Social Networks partner with in Mobile Advertising?